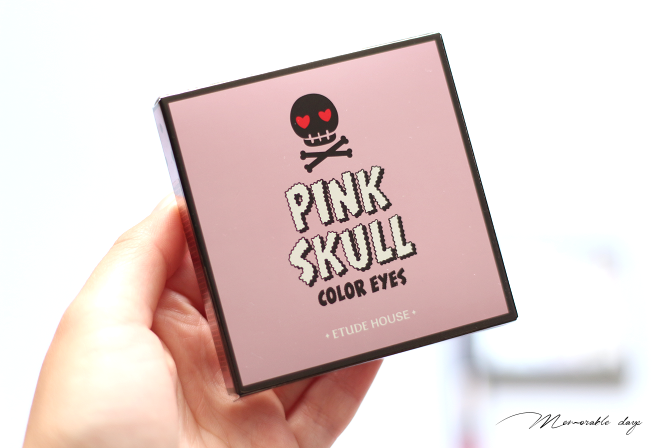 Swatches: Etude House Pink Skull Color Eyes and Lips x Tint | Memorable Days : Beauty Blog - Korean Beauty, European, American Product Reviews. Hi all! 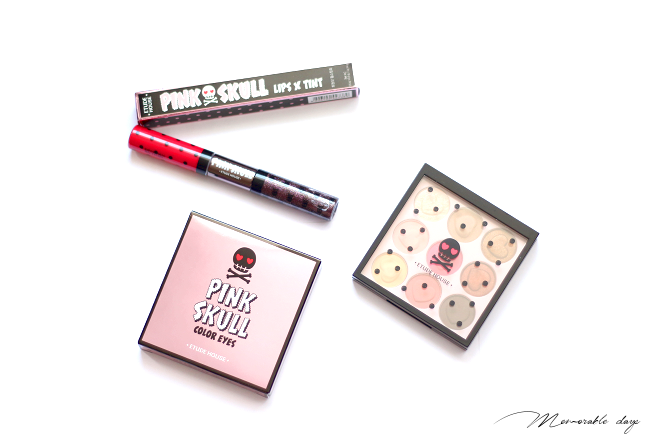 I have blogged about ETUDE HOUSE Pink Skull Make up collection before and in today's blogpost I will be swatching two of their products in this collection. I love the packaging! There are two shades and this one is in shade RD304. It has two sides: a glittery purple gloss and a red lip tint. 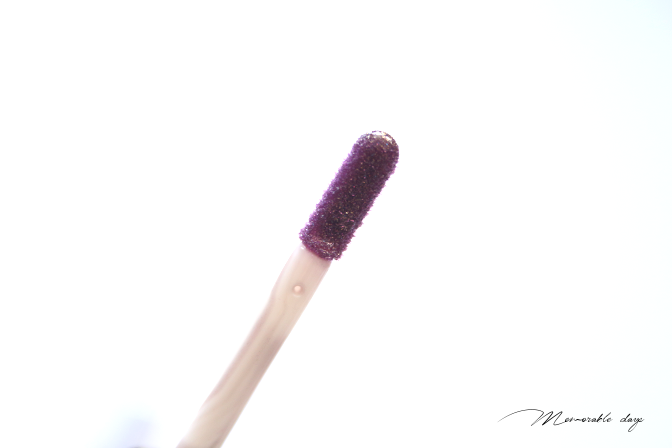 The little glitters can be clearly seen in the purple gloss, it has blue, gold and purple glitters. 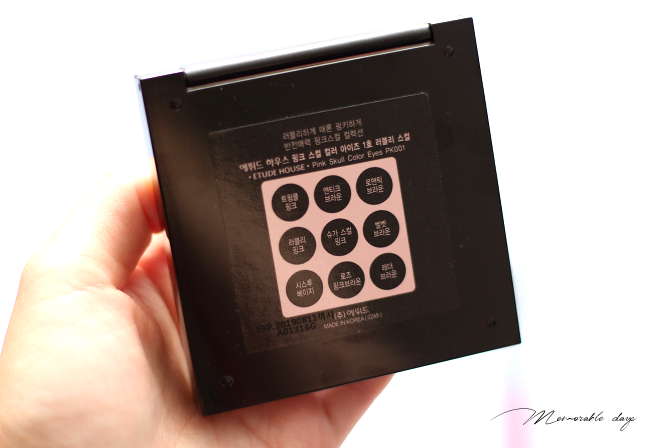 The red tint is very pigmented, ETUDE HOUSE is calling it the red mousse tint! Red mousse tint: Dimethicone, Silica, Phenyl Trimethicone, Polyglyceryl-2 Triisostearate, Pentaerythrityl Tetraisostearate,Dimethicone/Vinyl Dimethicone Crosspolymer, Trisiloxane, Red 7 Lake (Ci 15850), Polyethylene, Titanium Dioxide (Ci77891), Kaolin, Synthetic Wax, Polyglyceryl-2 Diisostearate, Polyhydroxystearic Acid,Dextrin Palmitate, Disteardimonium Hectorite, Euphorbia Cerifera (Candelilla) Wax, Propylene Carbonate, Fragrance,Yellow 5 Lake (Ci 19140). Purple gloss: Diisostearyl Malate, Tridecyl Trimellitate, Dextrin Palmitate, Calcium Sodium Borosilicate,Silica, Red 27 (Ci 45410), Titanium Dioxide (Ci 77891), Tin Oxide, Polyglyceryl-2 Triisostearate, Fragrance, Iron Oxides (Ci77499). 1. Apply the red soft mousse tint on the entire lips as if applying full cover to brighten and smoothen the lips. 2. Lightly apply the pearl tint shot on the inside of the lips to make the two colors produce natural gradation, and then widely spread. 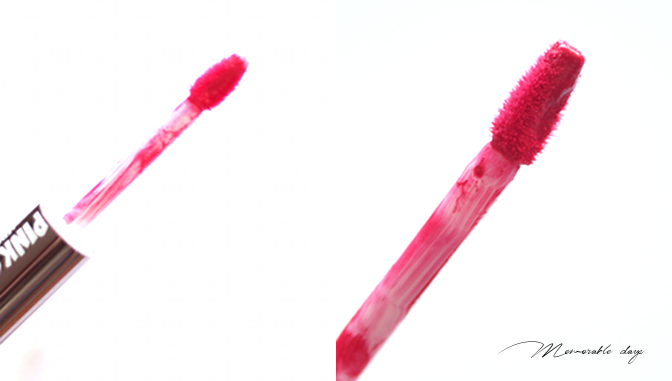 In the two pictures below I have only applied the red mousse tint. 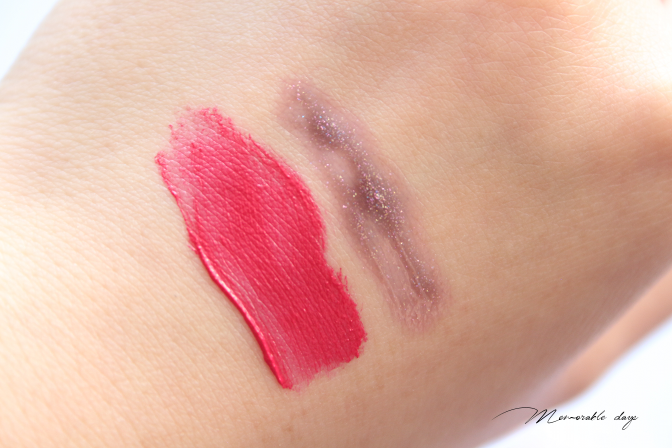 The red shade is a mousse consistency that is very pigmented and easy to apply. I love how moist it feels on the lips, not sticky at all. The applicator is also easy to work with. It doesn't have a matte finish but more of a glossy finish. Re-application is definitely needed after you drink or eat. It won't stay long on the lips if you don't re-apply. In the picture below I included the purple gloss on top and you can see the shade turned a bit darker. It's a dark purple gloss with holographic shimmer running through it. You can wear both shades together how I did, you can create a gradient effect with it or you can wear it separately. 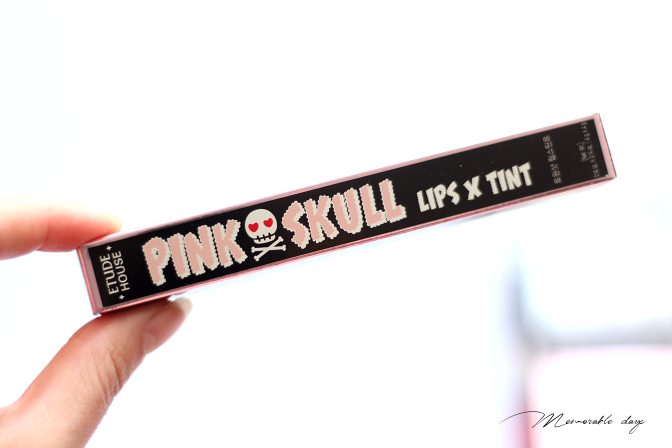 I don't prefer it separately since I am not a fan of dark purple shades on the lips. 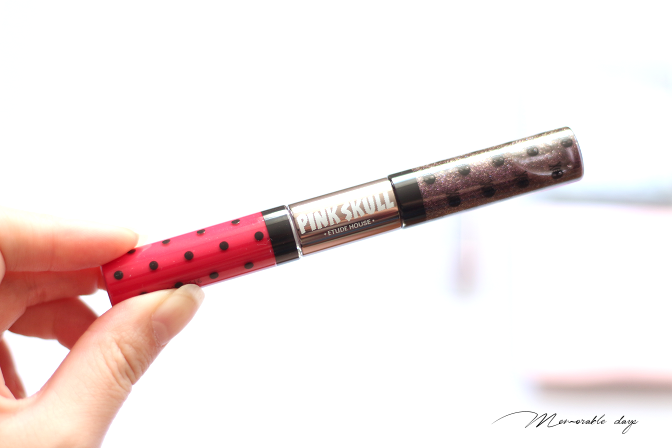 I am loving the packaging - the polka dots and the black and pink combination! 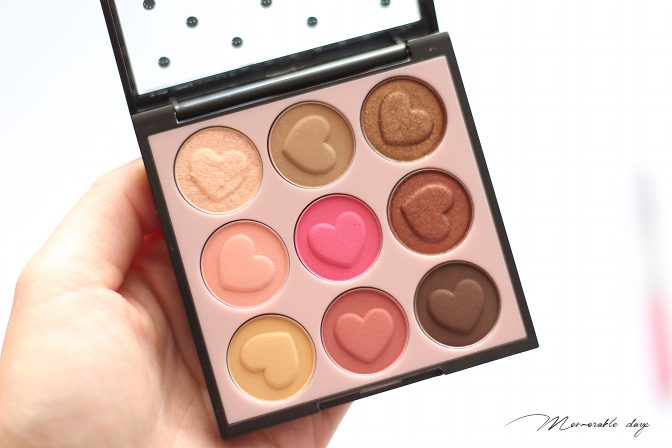 This is an eyeshadow palette that includes 9 shades which are very wearable. 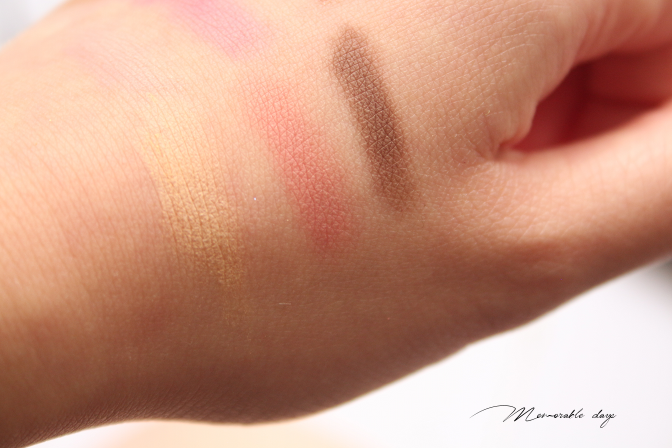 Not all of the shades are pigmented, most are but some, like the yellow and the light pink one are not. 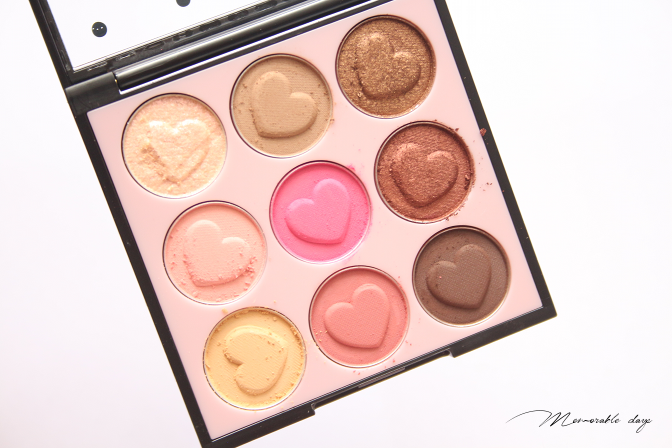 You can easily carry this one in your make up bag since it isn't big. 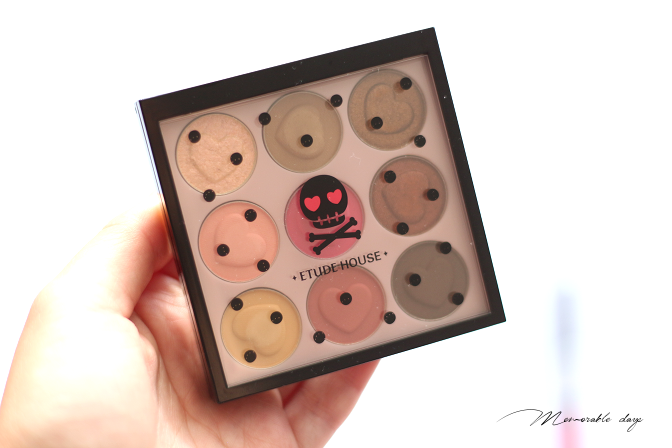 The downside of this palette is that it does get crumbly when you go over the shades with your eyeshadow brush. 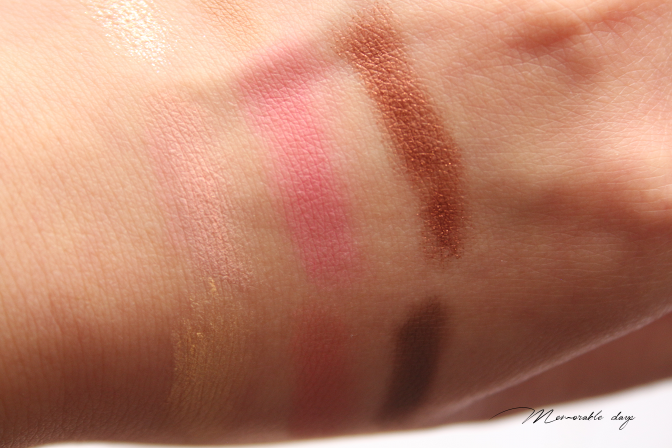 The left and middle ones are pink shades, both matte and the other one is a bronze shade. 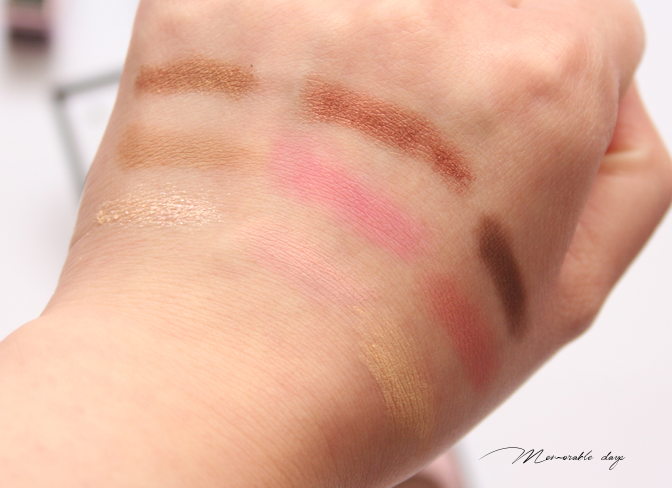 The most left one isn't that pigmented while the other two are. 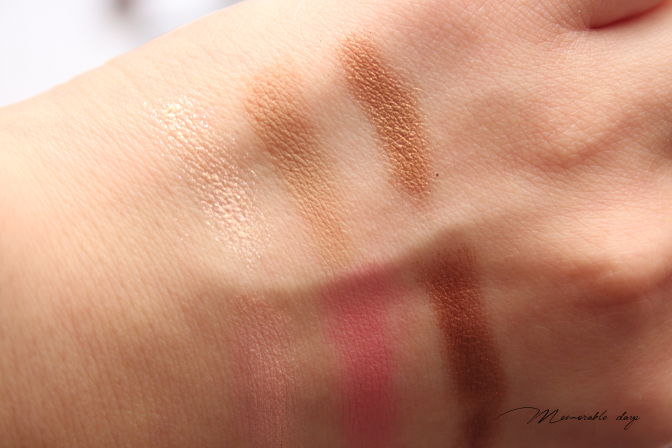 All these shades are matte. The yellow one has the least pigmentation. In the middle there is an orange shade and the last one is a dark brown shade. Talc, Silica, Iron Oxides (Ci 77489), Calcium Aluminum Borosilicate, Calcium Titanium Borosilicate, Diisostearylmalate, Magnesiummyristate, Octyldodecylstearoyl Stearate, Phenyl Trimethicone, Methyl Methacrylate Crosspolymer, Dipentaerythrityl, Hexahydroxystearate/ Hexastearate/ Hexarosinate, Hydrogenated Polyisobutene, Polymethyl Methacrylate, Triethylhexanoin, Zinc Stearate, Neopentyl Glycoldiethylhexanoate, Polyethylene, Caprylic/ Caprictriglyceride, Magnesium Stearate, Dimethicone, Ethylhexylglycerin, Phenoxyethanol, Polybutene, Hydrogenated Poly (C6-14 Olefin), Isostearyl Neopentanoate, Glyceryl Caprylate, Hdi/ Trimethylol Hexyllactonecrosspolymer, Methicone, Ptfe, Diphenylsiloxyphenyl Trimethicone, Pentaerythrityltetraisostearate, Tinoxide, Beeswax, Triethoxycaprylylsilane, Aluminumhydroxide,P olyglyceryl-2 Triisostearate, Polyhydroxystearic Acid. [+/-Mica (Ci 77019), Titanium Dioxide (Ci 77891), Iron Oxides (Ci 77492), Yellow 5 Lake (Ci 19140), Red 7 (Ci 15850), Iron Oxides (Ci 77499), Iron Oxides (Ci 77491), Red 28 Lake (Ci 45410), Red 6 (Ci 15850). It's sold on Etudehouse.com, the Lips x Tint is sold for USD$12,96 and the Color Eyes eyeshadow palette is sold for USD$20,25 but is currently sold out on their official website. note: these products are send to me for review purposes by Etude House, this didn't affect my opinion about the product. I didn't receive money to write about it, see disclaimer.